KLTC-FM - Montanavision Media Inc.
Antenna Coordinates=47-02-05.7 N, 114-41-13.1 W (NAD27). Overall Height Above Ground Level=200 feet. Effective Radiated Power=100 kW Horizontal only. 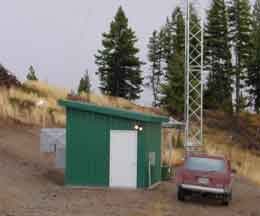 The transmitter site on Martel Mountain, November 13, 2002. 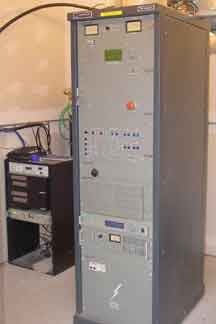 KLTC uses an Armstrong FM-10000T for its main transmitter, November 13, 2002. 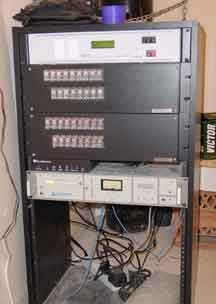 Transmitter support equipment for KLTC includes a Burk ARC-16 Remote Control, two IP-8 interface panels, and an Armstrong FM-10R STL receiver, November 13, 2002. 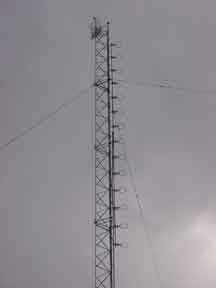 The KLTC tower is 200 feet tall, and supports a receiving antenna for the STL and a 14-bay main antenna, November 14, 2002.